It has been 5 years since the Nintendo 3DS and PlayStation Vita initiated the eighth generation of home consoles, followed by the Wii U in 2012, Xbox One and PS4 in 2013, and the New Nintendo 3DS in 2014. Compared to the seventh generation, the eighth is not that old. Two of the bigger consoles of this generation barely hit three years old last year while the PS3 and Wii turned 10 and the Xbox 360 turned 11. Oh, and the Wii U was officially declared dead and taken off of life support at the end of last year, may it rest in peace. But despite how young the eighth generation is, we might as well be halfway through it because all three of the major home consoles are receiving mid-gen refreshes(Though the Switch is more of a successor than a refresh, but I’ll get into that later on in the article. ), the Vita is pretty much dead in the US, just sitting on life support, and the 3DS already received its refresh in 2014 two years after its launch. This article is dedicated to spelling out for what each new system is like so that if you haven’t already jumped on board with one of them, you can at least be informed enough to make a decision on which one you would be more interested in. I’ll start by going over each system individually and then at the end I’ll compare them. The PlayStation 4 Pro is, as the name implies, still a PS4, but with more power under the hood with the original PS4 being slimmed down and turned into the entry-level device. The system is billed as being the first 4K-capable gaming machine, however this comes at the expense of 60fps since 4K is hardware intensive and so 9 times out of 10 the 4K is really just an upscaled image rather than native. The controller was also slightly upgraded: It now has a small light bar on the front of the controller that the player can actually see. The Pro model of the PlayStation 4 is in every regard more powerful than the base PS4 and the PS4's primary competitor the Xbox One, but it is only double the power of the PS4, which is far less of a leap than going from the PS3 to the base PS4. Now, this makes sense because the PS4 Pro is in fact a mid-gen refresh of the PlayStation 4, it isn’t intended to be a completely new system, otherwise it would have been a lot more powerful than it is. If anything this machine was not intended for 4K gaming like it’s marketed as, it was intended to hit stable 1080p60 at the graphical fidelity the console was already capable of. Gamers expected 1080p60 to be the new standard, it was not on either the PS4 or Xbox One without sacrifices, though more so the Xbox. The Pro simply makes that more achievable and of course whatever power is leftover is for the developers to use as they please. As promised by Sony, there are no exclusives for PlayStation 4 Pro. Every game is compatible with both the OG PS4 and the Pro with the Pro offering better performance on select games that have been patched, newer games releasing after the Pro’s release((Which has already occurred mind you.) automatically have Pro support built in. Since the Pro is only a half-step, I don’t expect there to ever be any exclusive games for it, not even for PSVR which it arguably can better support due to its higher specs. - 8GB of GDDR5 RAM, 5.5GB for games(Up from 4GB on OG PS4) and 2.5GB for the OS(Down from 4GB on OG PS4), plus 1GB of DDR3 RAM for the OS and other processes. If you’re one of hte people that doesn’t really consider Nintendo to be competing at this point, then the Xbox One is the weaker of the two big systems. It also had a really bad start to the generation because of the screwed up messaging and design concepts that did not resonate with its core audience: gamers. It tried to be too many things at once when all it needed to be was a game system. Fast forward two and a half years and Microsoft unveiled Project Scorpio. Like the PS4 Pro, the Scorpio is not considered the successor to the Xbox One, but rather a mid-gen refresh and it is scheduled to release in Autumn 2017. Microsoft has been claiming that the Scorpio will be the most powerful home console on the market when it launches later this year, and if the tech specs are correct, then that’s no lie. The Scorpio is set to outperform the PS4 Pro by a large margin, putting it in the region of being an entirely new system rather than the refresh it’s marketed as. Like the PS4 Pro, the Scorpio is backwards compatible with all Xbox One titles as well as all Xbox 360 titles under the backwards compatibility section of the Xbox One. There will also be no exclusive games for the Scorpio except for VR games as those are only possible on the Scorpio. All Xbox One titles going forward will support the regular Xbox One as well as Scorpio. If you’re looking to buy the king of the power race, the Scorpio will be it. That being said, Microsoft has boasted that Scorpio can output games at native 4K resolution, but considering the latest desktop GPU’s are still struggling to hit a stable 4K30 at maximum settings to my knowledge, I find reason to doubt that the Scorpio can hit native 4K whenever it wants. And if a supposedly leaked document is correct, Microsoft has indeed advised developers to look into checkerboard rendering, which is the same thing PS4 Pro does. In regards to VR, it is still unknown if the Xbox One will exclusively support the Oculus Rift seeing as how an Xbox One controller was included with the Rift for PC, if they’ll partner HTC for the Vive, or support both as it is highly unlikely that Microsoft has their own VR headset in the pipeline. Nintendo released the successor to the Wii, the Wii U, in 2012 to mixed reception. The marketing was so bad that people thought and still to this day think that the Wii U is an add-on for the Wii or just another version of the Wii. After 4 years on store shelves the Wii U only managed to sell 13 million units compared to the Nintendo 3DS’ whopping 65 million units and watching it dance on top of the more powerful Vita’s comatose body. As of October 2016, the Wii U was officially declared dead and production of the system ceased. The Legend of Zelda: Breath of the Wild will be the final Wii U game this March. Speaking of March, March 3rd will see the release of the Nintendo Switch which is at the very least the successor to the Wii U. Unlike the other two systems featured in this article, the Switch is not a mid-gen refresh, however it is in fact releasing less than 5 years after the previous system released and at a point that is arguably the halfway point of the eighth generation. If you want to get technical then it’s the first system of the ninth generation, but we’re not gonna get into that because Scorpio could also be considered ninth generation and that would just be unfair to the Switch from a power perspective. Encompassing over 500 million man hours of R&D on the part of NVIDIA and three years of development on Nintendo’s end, the Switch presents itself as an entirely new concept. It’s a home console that you can take on the go with you like a handheld device. Unlike the Wii U where you could move games from your TV to the GamePad, but only go a certain distance from the system, the Switch console is the handheld itself and so it can be taken anywhere with and played. It’s a home console because it can be placed in a dock that will then output to your television with a maximum resolution of 1080p. In terms of raw power, the Nintendo Switch sits in between the Wii U and Xbox One both when docked and portable judging by the games shown running on the system. 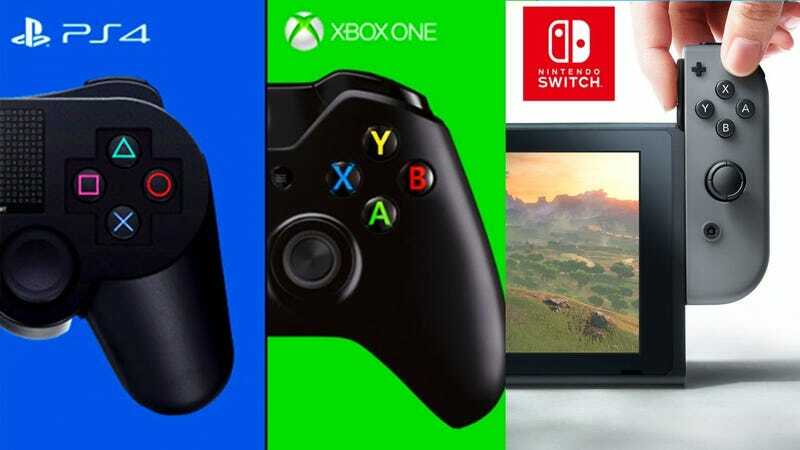 When compared against the Xbox One and PS4 the Switch definitely seems underpowered which is due in no small part to the handheld nature of the device, however, when looked at as a handheld device the Switch is the most powerful dedicated gaming handheld on the market surpassing both the PlayStation Vita and NVIDIA’s own Shield tablet, and of course it’s leagues more powerful than Nintendo’s previous handheld device the New Nintendo 3DS. The controllers for the system are jammed packed with technology such as IR sensors(Right controller only), gyros, enhanced motion control precision, and the new HD Rumble which can simulate the feeling of multiple objects, for example, a cup with 3 or 4 ice cubes in it that you can feel individually rattling around. And while the controllers, known as Joy-Con’s, come in sets of two, each half is a fully functioning controller with two shoulder buttons(One of which is a digital trigger), two inside buttons, a pause button, 4 face buttons, and an analog stick with click functionality. They can be used separately for multiplayer gaming or combined into a traditional controller setup that includes a split D-Pad(becomes the face buttons of the left controller when used separately. ), two triggers, and two shoulder buttons(The inside buttons are hidden and unusable when the controllers are docked to something.). The new pro controller also includes the gyro sensors and HD rumble functionality. Unlike the other two systems, the Nintendo Switch is NOT backwards compatible with either the Nintendo 3DS or the Wii U. The Wii U because it uses discs and Switch uses cartridges, 3DS because the Switch has a completely different architecture than past consoles and the cartridge slot does not have support for 3DS form factor cartridges. Thus all 3DS and Wii U games will either have to be ported to the Switch or released on virtual console. It is unknown if digital purchases will carry over. A bonus to using cartridges however is that games do not need to be installed to the systems storage and the RAM doesn’t need to temporarily store as much information freeing up more power for the games to use. This leads to slightly better graphics and faster loading times as well as more internal storage space for things like DLC, save games, and digital games. 1) There is a patent for VR functionality similar to Google Cardboard and other smartphone/tablet VR devices. In essence you would slip the Switch console into a slot on the top of the VR headset It won’t be as good as what you’ll find on PC or Project Scorpio(or even PS4 Pro), but it is also probably better for your wallet. 2) Nintendo has filed a patent for a supplemental computing device, meaning they can release add-ons down the line that increase the performance of the Nintendo Switch when docked at the very least. Rumors point to a potential SCD with specs oddly similar to a GeForce GTX 1060 desktop GPU, this is based on the reported specs of a more powerful dev kit produced in October that was sent out to major partners, but is still just a rumor at this time. If true, the SCD on its own would surpass the PS4 Pro in terms of performance, at least in the GPU department(The same “leak” pointed to the CPU being an ARM A73 due to the architecture being ARM v8-A, but that might already be in the Switch itself due to 64bit support). If the SCD pairs with the Switch’s regular SoC(System on Chip aka CPU and GPU on the same die) at its max power, the performance could go even higher though whether or not it would even come close to Scorpio is up for debate. Using this strategy, while the handheld mode will always be inferior to docked performance, you still simultaneously get a next-gen home console experience that can compete with at PlayStation 4 when docked and a next-gen handheld experience when undocked. The SCD is also likely to come in the form of a dock and will more than likely be less expensive than the Switch itself. And since it’s a first party product, Nintendo will always support it and third parties would more than likely be delighted to use it. - 6.2 inch 720p60 handheld display/Outputs 1080p60 max when docked. - 2.5 to 6.5 hours of battery life which will vary by game. For Example, The Legend of Zelda: Breath of the Wild will last approximately 3 hours and 15 minutes on a full charge. GPU - PS4 Pro = 4.2 TFLOPs; Project Scorpio = 6.0 TFLOPs; Nintendo Switch = 0.7 TFLOPs(Portable/Rumored)/1.0 TFLOPs(Docked/Rumored)/4.4 TFLOPs(GTX 1060 equivalent supplemental computing device/Docked/Rumored, if combined with Switch GPU would total 5.4 TFLOPs), no official specs, but keep in mind NVIDIA tech generally performs better and therefore 1 TFLOP of NVIDIA performance is usually, not always, better than 1 TFLOP of AMD performance. Think of it as premium versus budget. Resolution - PS4 Pro = Up to 4K for both games and movies/TV; Project Scorpio = Up to 4K for both games and movies/TV; Nintendo Switch = 720p in Portable mode, up to 1080p in Console mode, Rumored SCD would support up to 4K in Console mode.